Sports play an important role in our lives beginning when we are young. They allow us to enjoy spending time with friends and friends. Sports are at the same time a form of keeping in shape. Some are practiced outdoors where people benefit from fresh air and the sun’s warmth. Some are played indoors mainly because of weather conditions or just because they require a special field. Sports not only positively affect our physical appearance, but contribute to sustain our health. While practicing table tennis, for instance, you need to use your feet as well as your arms in synchronized moves to launch a ball in the opponent’s court. Movement keeps your body functioning properly. Ping pong and table tennis are two names of the same game. Ping pong was extensively used until 1901 when a company called J. Jaques & Son Ltd. chose to have it registered as a trademark for its own manufactured equipment. Table tennis was then used as the term to refer to equipment produced by other manufacturers. For ping pong as well as table tennis you need a table of specific dimensions: width of 1.525 m, length of 2.74 m and height of 0.76 m. The table is divided by a continuous net with a height of 1.525 m. Usually the surface is of blue, green or red color and the ball can be white or orange to be able to follow it easily from one side to the other. Rackets are made out of wood and covered with a laminated rubber either on one side or both depending on the player’s grip. No matter the materials combinations, natural wood should represent at least 85% of it. The principle of the game is to score points through your own service and quick response to the opponent’s court. There are two types of play: single implying two players and double implying four players. For single matches you don’t need to hit the ball so as it lands on the opposite corner of the table, while on a double match you must follow this rule. Service alternates between players each two points. The goal is for a party to achieve 11 points at two points advantage from the other candidate. There are a few defensive and offensive tactics to consider when preparing game strategy for both ping pong and table tennis. You can gain points when the opponent makes mistakes on its serve failing to deliver properly the ball on your side of the table. Ping Pong is the trademark name for J. Jaques equipment, while other manufacturers use table tennis when referring to their products. 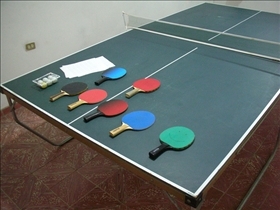 Game requirements are the same for ping pong and table tennis: a table, a ball, two rackets, 2 or 4 players. 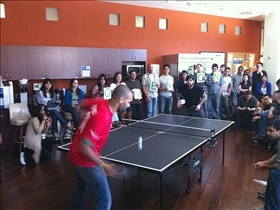 Game play for ping pong and tale tennis implies alternate serves between player courts until one of them gains 11 points and is two points ahead of the other player. Which term do you use normally?